This resource is part of the Museum Snapshot collection - a collection of smaller resources perfect for starters, plenaries or spare moments to explore something fascinating. The Samurai were warrior-nobles in Japanese society, with a strong honour code called bushido. The name 'Samurai' means 'ones who serve'. Before the 1550s the Samurai were fierce warriors attached to a daimyo or lord, whom they were loyal to and fought for. How did their role change? In the 16th Century, a politician and former Samurai Toyotomi Hideyoshi persuaded warring groups of Samurai to live peacefully. He convinced them to use diplomacy rather than fighting to achieve peace. After this point the samurai no longer had such an important role. They still existed and wore armour, but they were seen as spiritual guides rather than warriors. The bushido was now seen as a code for living a moral and spiritual life, and their armour became just a reminder of their historic role. 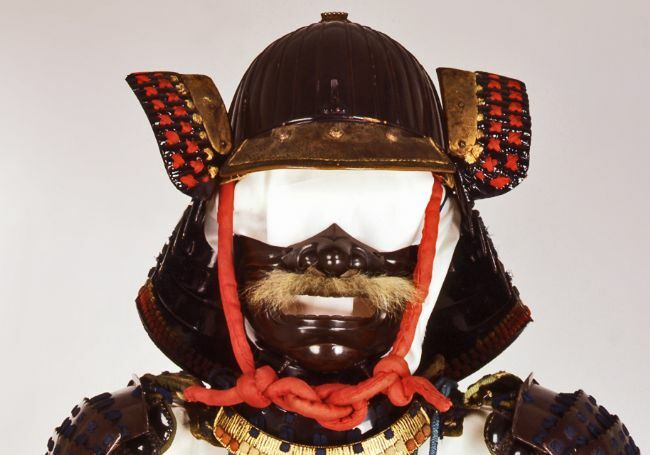 What does this suit of armour tell us about Samurai? The main body section is a do or cuirass. It is made from a series of plates or lamellae, little oblong-shaped pieces of steel linked by strips of leather and covered with layers of lacquer. The helmet has empty holders on either side which would have been used for a front crest or helm, and a hair pommel. A face mask has been decorated with ugly features to terrify the enemy. Extra protection is provided by a neck curtain of jointed metal, and shoulder guards made from small plates laced together with silk braid allowing for movement. Thigh guards and calf guards use a combination of chain mail and plates kept the lower body safe. Underneath his armour the Samurai would wear a one-piece baggy garment, a kimono on top of that and loose pants. What dangers do we need to protect ourselves from in our daily lives? Some animals use protective armour similar to the samurai. Which ones can you name? What can we learn from the example of Hideyoshi? How does the samurai armour differ from European armour? What sports do you know that have 'codes of honour'? What sports can you think of that need 'armour' to protect the players? 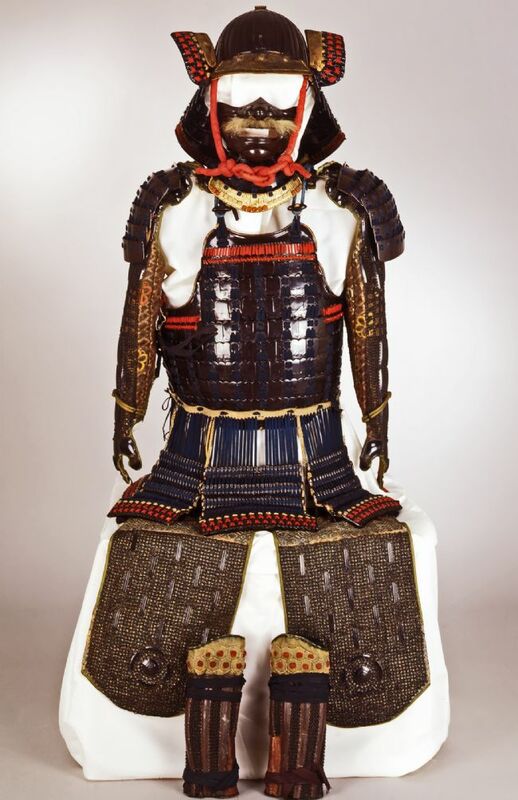 Creative writing: Look at the images of Samurai armour on this page and then explore the links below to find more images of Samurai artefacts. Write a description of how you think an opponent would have felt when he saw a samurai approach the battlefield. 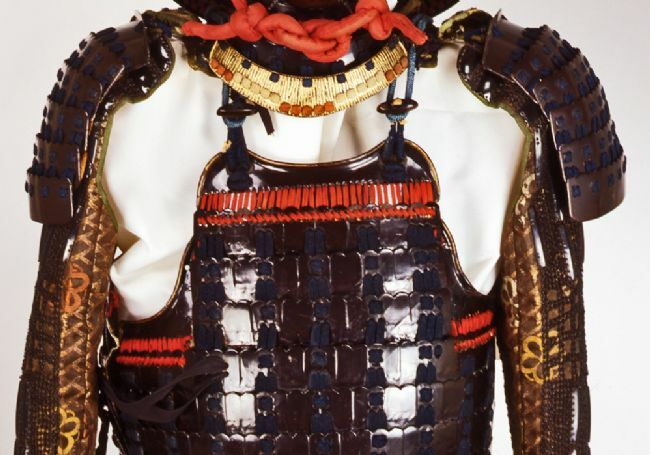 Design Samurai armour: The Samurai who wore this armour needed to use a sword while being protected from his opponent's sword. 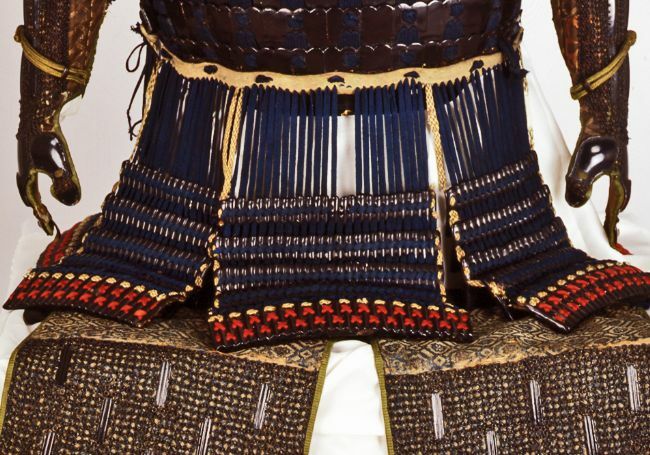 What sort of things would you have to consider if you were designing some Samurai armour?